Scientists at USC have developed a water-based organic battery that is long lasting and built from cheap, eco-friendly components. The new battery, which uses no metals or toxic materials, is intended for use in power plants, where it can make the energy grid more resilient and efficient by creating a large-scale means to store energy for use as needed. Such organic flow batteries will be game-changers for grid electrical energy storage. 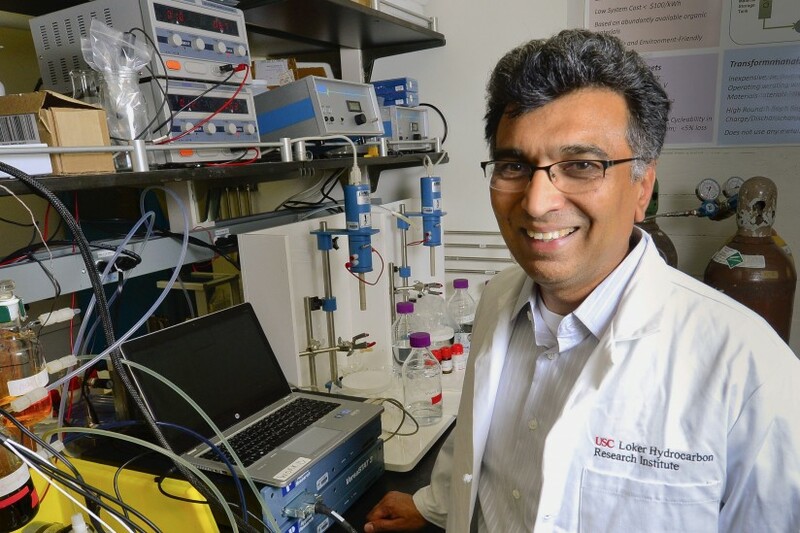 “The batteries last for about 5,000 recharge cycles, giving them an estimated 15-year life span,” said Sri Narayan, professor of chemistry at the USC Dornsife College of Letters, Arts and Sciences and corresponding author of a paper describing the new batteries that was published online by the Journal of the Electrochemical Society on June 20. 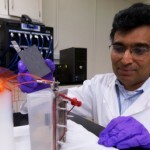 “Lithium ion batteries degrade after around 1,000 cycles and cost 10 times more to manufacture.” Narayan collaborated with G.K. Surya Prakash, professor of chemistry and director of the USC Loker Hydrocarbon Research Institute, as well as USC’s Bo Yang, Lena Hoober-Burkhardt and Fang Wang. “Such organic flow batteries will be game-changers for grid electrical energy storage in terms of simplicity, cost, reliability and sustainability,” Prakash said. The batteries could pave the way for renewable energy sources to make up a greater share of the nation’s energy generation. Solar panels can only generate power when the sun’s shining, and wind turbines can only generate power when the wind blows. That inherent unreliability makes it difficult for power companies to rely on them to meet customer demand. With batteries to store surplus energy, which can be doled out as needed, that sporadic unreliability could cease to be an issue. “ ‘Mega-scale’ energy storage is a critical problem in the future of renewable energy,” Narayan said. The new battery is based on a redox flow design — similar in design to a fuel cell, with two tanks of electroactive materials dissolved in water. The solutions are pumped into a cell containing a membrane between the two fluids with electrodes on either side releasing energy. The design has the advantage of decoupling power from energy. The tanks of electroactive materials can be made as large as needed — increasing the total amount of energy the system can store — or the central cell can be tweaked to release that energy faster or slower, altering the amount of power (energy released over time) that the system can generate. The team’s breakthrough centered on the electroactive materials. While previous battery designs have used metals or toxic chemicals, Narayan and Prakash wanted to find an organic compound that could be dissolved in water. Such a system would create a minimal impact on the environment and would likely be cheap, they figured. Through a combination of molecule design and trial-and-error, the scientists found that certain naturally occurring quinones — oxidized organic compounds — fit the bill. Quinones are found in plants, fungi, bacteria and some animals, and are involved in photosynthesis and cellular respiration. “These are the types of molecules that nature uses for energy transfer,” Narayan said. Currently, the quinones needed for the batteries are manufactured from naturally occurring hydrocarbons. In the future, the potential exists to derive them from carbon dioxide, Narayan said. The team has filed several patents in regards to design of the battery and next plans to build a larger scale version. The research was funded by the Advanced Research Projects Agency-Energy: Open-Funding Opportunity Announcement program (grant number DE-AR0000337), USC and the Loker Hydrocarbon Research Institute. 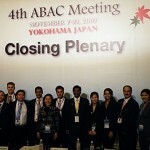 USC Marshall MBA students accompanied traveled to Japan to report on sustainability challenges. A research team of USC Marshall MBA students has concluded that a sustainable world is not within immediate reach as issues surrounding unclear global policies, affordability and myopia among political leaders and consumers are thwarting businesses from investing in sustainable energy.